We offer a variety of rental units to suit your needs. Each of our units is a little bit different: some are pet-friendly, others are not; some have kitchens and bathrooms, and others are more primitive. The descriptions below are to give you an idea of what may be available. All guests staying in lodgings are asked to read and sign our cabin agreement during check-in. This agreement must be signed by the party renting the cabin, whose credit card number is on file and that this person be at least 21 years of age or older. We do not accept cash payments for cabin rentals. Check-in for cabins starts at 3pm. Check-out is by 11am. In order to best serve our campers and have adequate time to clean these units, we do not allow late check-outs or early check-ins on lodging. We require all cabin campers to pay a cleaning deposit at check-in. Primitive cabins carry a deposit of $50 and deluxe cabins are $100. This deposit will be refunded once housekeeping clears the cabin after check-out (please note, although we refund the same day as check-out, the deposit may take a couple days to clear your bank). If you have questions, please call our reservations staff at 540/337-3920. Our primitive cabins are one-room lodgings that sleep four. These cabins are not equipped with linens, kitchens, or bathrooms; they have electricity but no water. For your convenience, they are located near the upper bathhouse. K4’s queen size bed and lower twin bunk. The view from the upper twin bunks of K4 is of the rest of the cabin, including the lower twin bunk and the queen size bed. 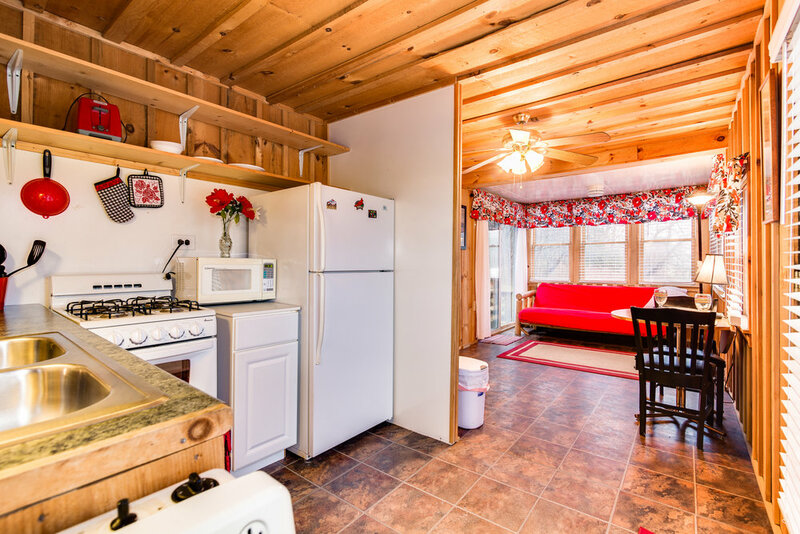 These cabins also come with a refrigerator and a fire pit with a grill cover for cooking and a picnic table. In the winter, we equip them with space heaters for your comfort; in summer there is air conditioning for all units. These cabins are pet-friendly though there is a $5 per pet/per day fee, so please let us know if you'll be bringing your furry friend with you. 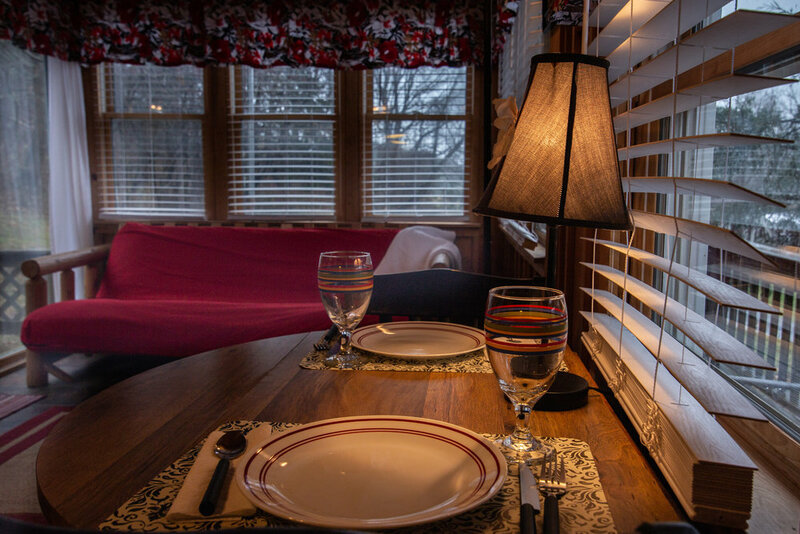 The deluxe cabins feature a futon in the living space, a table and chairs that seat four, and a partial kitchen (pictured). Kitchen linens, pots and pans, glasses, silverware, and dishes are included. There is also a television with campground cable. From this angle, you can see the dining table and partial kitchen of DK6. The partial kitchen, featured here, includes a small refrigerator, two burner cooktop, microwave, sink, toaster, and coffee maker. Through the doorway, you can see the bedroom. The partial kitchen, featured here, includes a small refrigerator, two burner cooktop, microwave, sink, toaster, and coffee maker. Dishes, flatware, pots and pans, and glassware are also included. Pictured here, the bedroom of DK6 includes a full-size bed on the bottom bunk with a twin bed above it. Please plan to bring your own linens. The bathroom has all the luxuries of home, including a toilet, sink, and shower (pictured). 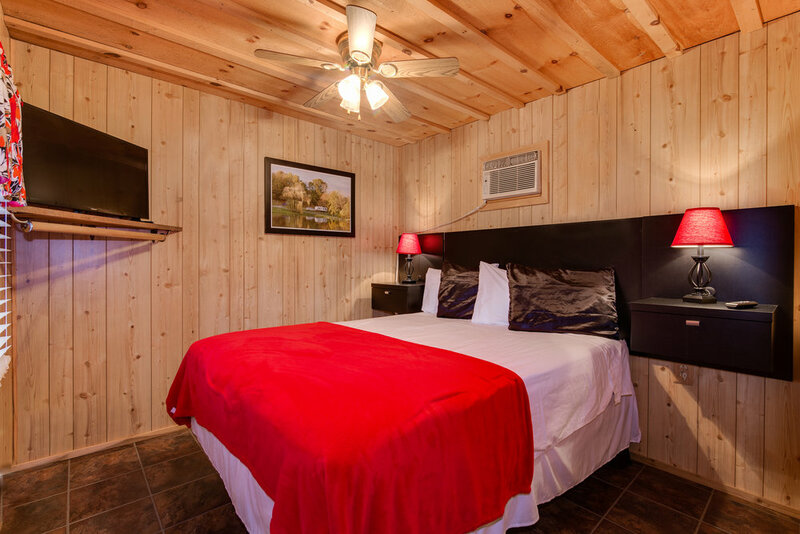 Our deluxe cabins are like a home away from home! Equipped with a partial kitchen, including a two-burner cooktop, mini-refrigerator, toaster, microwave, and coffee maker, as well as all the dishes, pots, and pans you'll need to prepare a meal for your family. They have heat and air conditioning, so you'll be comfortable no matter the time of year. Able to sleep up to five people, there's a full-size master bed with a twin bunk above it and a fold-out couch or futon in the living space, as well as a television (with cable!) and a full bathroom. Outside, there's a charcoal grill, fire ring, picnic table, and a porch swing. These cabins do not come with linens, but we're happy to provide them to you for a fee. Some of these cabins are pet-friendly and some are not, to accommodate campers with allergies, so please let us know if you will be bringing any animals with you. Campers bringing pets into pet-friendly cabins will be charged a $5 per pet/per day fee. These cabins are perfectly suited for a couple, although they can sleep up to three people if you're really friendly. These cabins have a great room layout (no separate bedroom) with a full bed and a futon. The partial kitchen contains a two-burner cooktop, mini refrigerator, toaster, coffee maker, microwave, and enough dishes, pots, pans, and utensils to have a cozy dinner. There's also a television with cable, a seating area for dinner, and a gas fireplace for those cozy autumn nights. 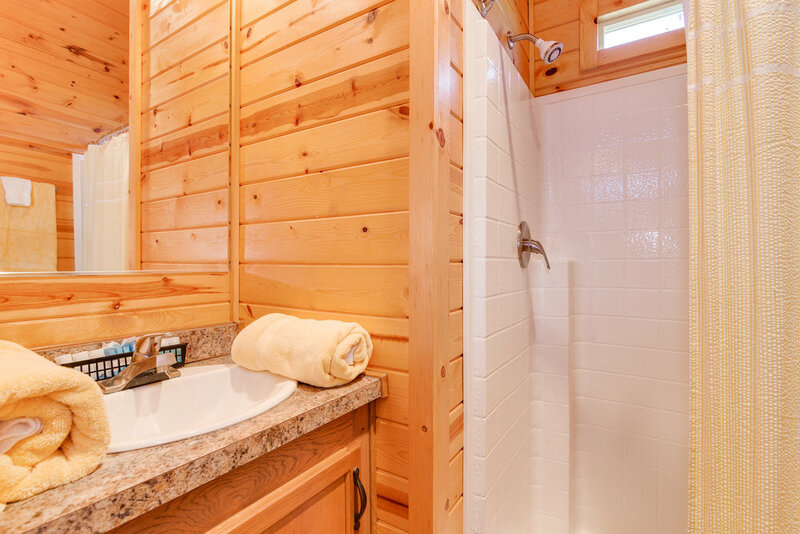 These cabins also feature a full bathroom and come with a set of linens. Outside, you'll find seating on the covered porch, a charcoal grill, a picnic table, and a fire ring. Bring your furry friend to these cabins, because they are pet-friendly with a $5 per pet/per day fee. Click here for a virtual tour of Lodge 10 and Lodge 11. Our beautiful lodges are the biggest accommodations we offer! With a separate master bedroom, bunk room with two twin beds, and a fold-out couch or futon, they sleep six comfortably. 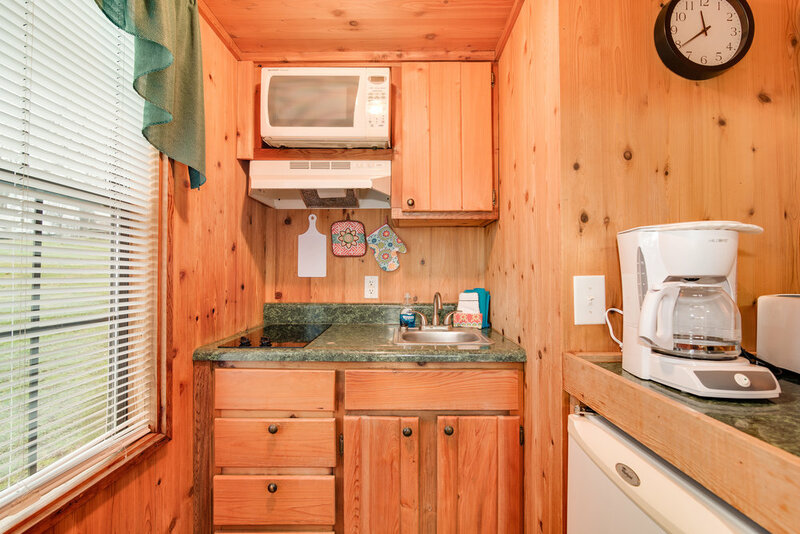 The lodges have full bathrooms, partial kitchens (with a two-burner cooktop, microwave, toaster, coffee maker, mini refrigerator, and all the pots, pans, utensils, and dishes you'll need). Linens are included. In the living area, there is also a flat-screen television. Fortunately for your furry friend, one of our lodges is pet-friendly with a $5 per pet/per day fee, so let us know if you'll be bringing your dog or cat with you! This unit sleeps two people comfortably with a queen size bed in the master bedroom (which also features its own television! ), a full bathroom, a living area with a television and an electric fireplace, and a seating area. The kitchen contains a microwave, a coffee maker, toaster, four-burner stove with an oven, dishes, glassware, and utensils. Out back, there's a gas grill and a picnic table, and the front has a fire ring. It also comes with linens and is pet-friendly with a $5 per pet/per day fee.